Originally used to patrol the Czechoslovakian borders, the Czechoslovakian Wolfdog's talents have extended to search and rescue, tracking, herding, and several dog sports. 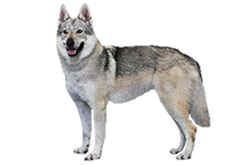 Although they are somewhat more difficult to train due to their wolf ancestry the Czechoslovakian Wolfdog is still used as working dogs in the Czech Republic and Slovakia. While the development of most breeds is unknown, the Czechoslovakian Wolfdog is well documented. This breed is the result of a scientific experiment done by Karel Hartl. In the 1950s the Czechoslovakian (modern-day Czech Republic and Slovakia) government wanted to explore the possibility of breeding dogs and wolves. Four Carpathian Wolves and between 40-50 working line German Shepherd Dogs were used in its creation. The Czechoslovakian Wolfdog line was fixed by 1965 and the Czechoslovakian Military began using them for border patrol and police work. It gained Fédération Cynologique Internationale recognition in 1998. Although still somewhat rare, the Czechoslovakian Wolfdog is slowly gaining popularity around the world. It has even made its way to the United States, where is is listed with the American Kennel Club's Foundation Stock Service. Is the Czechoslovakian Wolfdog Right for You?